This Famous Commando knife has been in service with the British Royal Marine Commandos since 1943. Quality manufacturing techniques and the finest Sheffield steel are used to create these knives by long established UK Military contractors. These are not cheap Chinese copies - these knifes are 100% made in England. They feature a full length tang and a stiletto blade that is hardened to Rockwell C52. 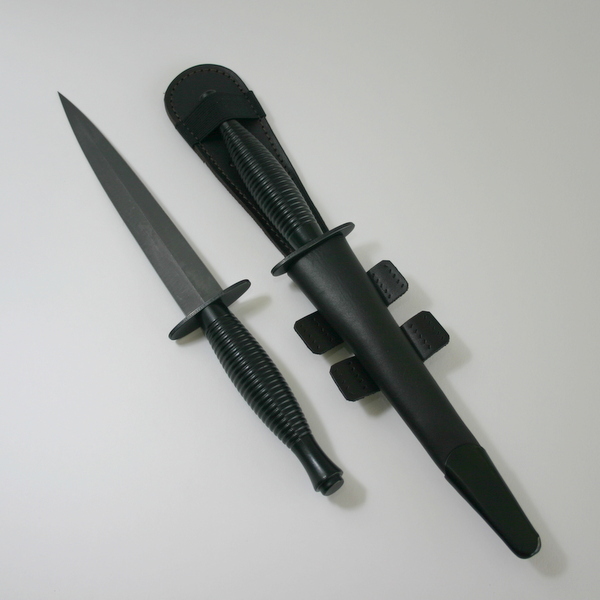 This current Pattern Commando Knife has a low lustre blackened blade, no visible markings and precision balanced in line with current military specifications. It is supplied with a standard issue best bridle leather leg sheath with sew-on leg tabs and a "silent release" elastic retention loop. A blackened steel chape protects the blade tip when sheathed. The knife comes with a manufacturers letter of authenticity.